When we make a decision not to give money to the beggar on the street, sometimes a judgment accompanies that choice. “He’s going to use the money for alcohol or drugs,” we might think. Or, we might tell ourselves that he is a scam artist who doesn’t really need the money and is preying on us because we seem sympathetic. The reality is we don’t know who he is. We don’t know his intention. We don’t know his story. We can choose to withhold our money, but we should not judge him just because his struggle is different than ours. That’s the problem with judging someone. We can’t judge without elevating ourselves and belittling someone else. 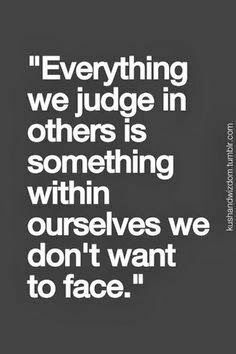 As the quote goes: “Belittling someone is to ‘be little.’” Isn’t it ironic that we forget our own problems in the midst of judging others? Perhaps that’s why we judge – to focus on someone else’s challenges and not our own. We can always find someone worse off than us. But as another quote goes: “Dimming someone’s light will not make yours shine brighter.” In fact, I think it makes our light darker than the person we condemn. We judge others on the things that we never have to struggle with. If we judged people based on our own struggles, there’d be less judging and more empathy in the world. Although we’ve all done it, judging is not ok. We don’t like to be judged. We should not judge. We never know a person’s story. If we truly embodied the ‘there but for the grace of God, go I’ philosophy, we would count our blessings instead of someone else’s faults. We would extend the same grace to others that we want others to extend to us, when we fall short, when we get it wrong, when we struggle. These days, everyone has an opinion about what God will find pleasing and what He despises. We believe God is pleased with us and that He is focused on another person’s shortcomings. Except it doesn’t work that way, aside from in our own illogical minds. We all fall short in our own particular way. We need less judgment and more empathy. We need to start respecting other people’s journeys, despite how different it is from our own walk. Every life path is fraught with valleys as well as peaks. Be an encourager during someone’s hard times and a cheerleader during their good times. There’s plenty of people who will judge them no matter what they do – good or bad. Don’t be one of them. Don’t be little.